Budapest, a city of approximately two million, is an architectural gem straddling the Danube River. As Hungary’s capital, it is the administrative, business, educational, and cultural center of the country. Despite the scars inflicted by four decades of communist rule, Budapest retains a turn-of-the-century feel with its marvelous architecture and rich history. 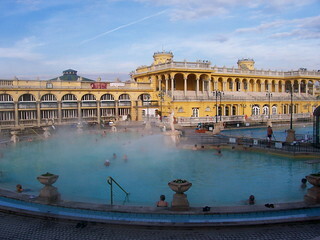 The city is famous for its thermal and medicinal baths and boasts a vibrant cultural scene, with theaters, concert halls, museums, cinemas, and wide variety of restaurants and cafes. An excellent public transportation system will enable you to explore the city and all it has to offer. The Budapest program, offered through Hobart and William Smith Colleges' affiliation with the Council on International Educational Exchange (CIEE), is based at Corvinus University, founded in 1948 and known as Karl Marx University until 1990. Its 14,000 students take courses in general economics, business administration, public administration, and social sciences. The CIEE Study Center is hosted by the Faculty of Business Administration and courses are taken in various faculties throughout the University. All students take a Hungarian language course and select four courses from among the CIEE area studies electives or Corvinus University economics courses offered in English, OR select three courses and a credit-bearing internship. For more information on courses offered, please visit the CIEE Hungary page here. Scroll to the bottom of the page (Academics) and click on course descriptions. This program will be of particular interest to students in economics, political science, history, international relations, and anthropology. Courses are also available in art history and literature/film studies. Internships and community service placements are available to interested students but are not guaranteed. This program is open to sophomores, juniors and seniors in good academic and social standing who have a minimum GPA of 2.75. Please note that this is a highly competitive program with limited program spots. Due to the challenging nature of study abroad, student academic and disciplinary records will be carefully screened. Students are housed in Corvinus University’s Ráday dormitory located within walking distance of the University. Each student shares a double or triple room with other Corvinus University or CIEE students. The dormitory has communal kitchens and laundry facilities, and internet is available throughout the facility. It is located in a popular shopping district with cafés, restaurants, schools and a supermarket. The program includes visits to sites of historic and cultural importance in and around Budapest such as museums, galleries and theaters. Students also participate in excursions to the Danube Bend and to other culturally and historically significant parts of Hungary. In addition, a four-day study tour to rural villages in Transylvania in Romania is included. During this excursion, students stay with families and learn about this unique area, one of Europe’s most ethnically diverse regions. Students will be charged standard HWS tuition and fees, room fees, and a $600 administrative fee. This will cover tuition for a five-course semester, health insurance, housing, and program-related activities and excursions. Note that no HWS board fee will be charged. Students should plan to bring their board fee to cover meal expenses throughout the program. While meal expenses will vary according to individual tastes, we estimate that $1900—$2000 should be sufficient for students who typically prepare their own meals. Additional expenses not covered include airfare, books, visa, and personal expenses (laundry, entertainment, and independent travel). We estimate airfare for this program at $1100-$1300 from the East Coast, books at $200, local transport at $75, and visa at $100. It is difficult to give an accurate estimate of personal expenses because student spending habits differ considerably. We would suggest a minimum of $1,500 above and beyond meal expenses. However, students on a tight budget should be able to manage with less. If you are concerned about finances, we strongly encourage you to talk to the CGE staff who can offer information and advice based on your specific situation. NOTE: CIEE has supplemental scholarships available to students who have been accepted to the Budapest program. Please see Amy Teel at the CGE for information on how to apply for these scholarships.